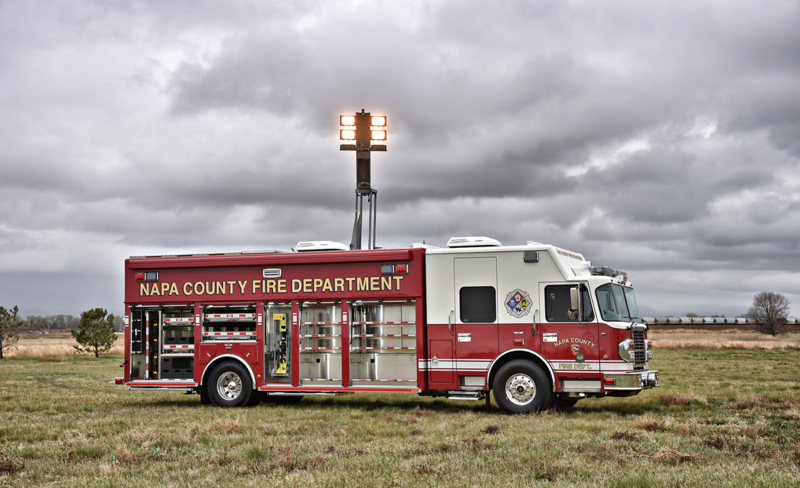 FORT COLLINS — May 8, 2018 — The Napa County Fire Department has taken delivery on a new hazmat truck, featuring SVI Trucks’ tried-and-true hazmat design — a partial walk-in unit with lab area and slideout tech station. The unit will go into service immediately and then make an appearance Sept. 4-7 at the 29th Annual Continuing Challenge HAZMAT Workshop in Sacramento, Calif. The unit features SVI Trucks’ proven walk-in hazmat design, the same go-to design Salinas, Calif., put into service last year after showcasing the vehicle at the 2017 HAZMAT Challenge. SVI’s latest hazmat truck features an aluminum body mounted on a Spartan Gladiator MFD chassis with a 450HP Cummins L9 engine and Allison EVS 3000 transmission. The cab command center features a 10-inch raised roof, L-shaped desk with radio console and Middle Atlantic 24U Data Rack. The walk-in hazmat lab features a spacious, heavy-duty slideout with stainless-steel workbench, Flow Sciences interior lab containment enclosure and WeatherPak TRx2 Weather System. Meanwhile, the Napa hazmat exterior is equipped with a Zico Nitrogen bottle lift, a Bosch Command Camera System on 40-foot mast, OnScene Solutions heavy-duty cargo slides with LED compartment lights and a Command Light CL611A-HQ light tower with Whelen Pioneer+ LED scene lights. Click here to view the specs, features and drawings of this truck.